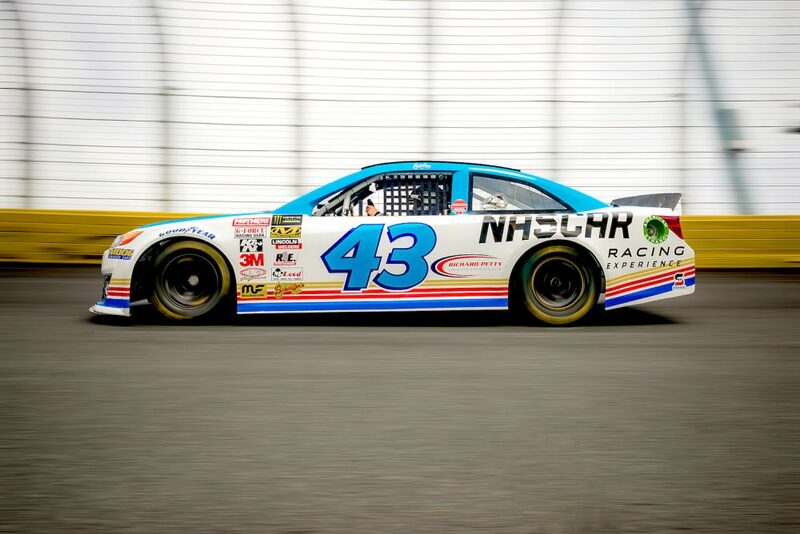 Is NASCAR Racing Experience the same as Richard Petty Driving Experience? Yes. NASCAR Racing Experience purchased Richard Petty Driving Experience, merging organizations and operations to deliver the ultimate on-track fan experience at more than 16 racetracks around the country. Together, these two trusted brands will create an even more powerful and realistic experience for the consumer including timed racing sessions vs. lap counting, personal spotters, and more driving experiences with more economical price points. We highly recommend you make a reservation in advance. Space is limited on any given track day and most dates do sell out in advance. Why risk the chance of not getting to drive by waiting til the last minute? Go ahead and make your reservation today! Yes! Gift Cards are the perfect gift for your special someone. Gift cards are good for ANY amount and get to you fast! Gift Cards are emailed when you purchase, can be personalized and NEVER expire. Plus Gift Cards are good for ANY of the BEST experiences offered- Richard Petty Driving Experience, NASCAR Racing Experience and Mario Andretti Racing Experience. Q: WHAT’S THE DIFFERENCE IN RICHARD PETTY DRIVING EXPERIENCE, NASCAR RACING EXPERIENCE AND OTHER RACING SCHOOLS OR DRIVING EXPERIENCES? A: Richard Petty Driving Experience and NASCAR Racing Experience are the most realistic NASCAR driving experiences offered. *No lead cars to follow- as you drive timed racing sessions- no lap counting. Q: WHAT RACE TRACKS DO YOU OFFER? Q: WHAT KIND OF RACE TRACKS WILL I BE DRIVING ON? A: All oval, paved racetracks. The same race tracks you see NASCAR race on. A: Yes, reservations are recommended for all experiences. Dates and times are limited and do sell out in advance. A: You can make a reservation at www.NASCARRacingExperience.com or call our customer service department at 704-886-2400. Q: DO YOU HAVE GIFT CARDS? A: Yes, you can purchase a gift card for any driving session or ride package. Gift cards are good for ANY of the nationwide speedways, NEVER expire and can be redeemed for either NASCAR Racing Experience or Mario Andretti Racing Experience. Gift Cards are for a one time use and do not carry a balance. Q: WHAT IF I CAN’T DECIDE WHAT DATE, TIME AND LOCATION? A: Get a gift card for any dollar amount. Gift cards are good at any of our nationwide locations and never expire. Q: WHEN DO TIMED DRIVING SESSIONS BEGIN AND END? A: The time on your driving session begins as you start driving down pit road and it ends when you pull back into the pits. Q: WHERE DO I GO ONCE I AM AT THE RACETRACK FOR MY EXPERIENCE? Q: HOW LONG DOES IT TAKE TO DO A DRIVING EXPERIENCE? A: All timed driving sessions you should allow up to 3 hours. This includes the drivers meeting, training and instruction. Q: DO I NEED A VALID DRIVER’S LICENSE? A: Yes, all drivers are required to bring a valid driver’s license to the racetrack and present when checking in. Q: WHAT IS THE $39 DRIVERS FEE? A: We’ve got you covered! For a $39 Driver’s Fee, drivers are covered with Vehicle Liability Insurance. Plus get a Souvenir Racing License, which is included in the $39 Drivers Fee. The Drivers Fee is required for all drivers and is due at check out when making a reservation. Q: CAN I BRING FRIENDS AND FAMILY TO WATCH? A: Absolutely! We encourage you to bring friends and family. A trackside viewing area is available at all tracks. Q: WHERE DO WE NEED TO GO AT THE RACE TRACK TO CHECK IN? A: Once at the racetrack, you need to go to the Infield Tunnel, drive thru the tunnel to the center of the racetrack and park. Drivers proceed to the Media Check-in Center and Rides proceed to the trailer on Pit Road. A: Yes, if you come up on a slower racecar, your personal racing instructor will instruct you to pass. A: Comfortable, casual clothes depending on the time of year as your clothing will be worn under a driving suit. Wear closed toe shoes, tennis shoes are recommended. Q: DO I NEED TO BRING RACING GEAR? A: No. Richard Petty Driving Experience, NASCAR Racing Experience and Mario Andretti Racing Experience provide you with everything you need except shoes and gloves. *Race shoes and Gloves are NOT required. Q: WHAT IF I CAN’T FIT IN THE RACE CAR? A: The weight and height requirements are a general range and are not guaranteed. In the event you can’t fit in the car, we will do our best to help accommodate you at the racetrack with other options. A: Yes. Drivers must have a valid driver’s license and should not exceed 6’7″, 300 lbs. Our race cars do not have doors, so participants must have the ability to climb through a 15″ high by 30″ wide window that sits 36″ from the ground. Passengers for Ride Alongs must be a minimum of 5 ft. tall and 100 lbs. Under 18 years old parental consent is required. Q: DO I HAVE TO KNOW HOW TO DRIVE A STICK SHIFT? A: Yes, It is recommended. We recommend the ability to drive a manual transmission (stick shift) to participate in a driving experience. If you don’t have the ability please let us know in advance so we can be prepared to assist you. Q: WHAT HAPPENS IF I WRECK A RACE CAR? A: The Driver will forfeit all remaining laps and will not be allowed to drive again or be issued a refund. Q: CAN I DRIVE IF I HAVE HEARING AIDS? A: Yes, but we will need to know in advance so we can plan accordingly. Drivers communicate with spotters using RE ear buds. You will be required to remove your hearing aids. If you can’t hear clearly without the hearing aids, we will set up a lead follow experience for you. Please call us in advance if you have concerns so we can plan ahead. Q: DID NASCAR RACING EXPERIENCE BUY RICHARD PETTY DRIVING EXPERIENCE? A: Yes. NASCAR Racing Experience purchased Richard Petty Driving Experience, merging organizations and operations to deliver the ultimate on-track fan experience at 16 racetracks around the country. Together, these two trusted brands will create an even more powerful and realistic one for the consumer including timed racing sessions vs. lap counting, personal spotters, and more driving experiences with more economical price points. Q: Can I use my Richard Petty Driving Experience gift card at NASCAR Racing Experience or Mario Andretti Racing Experience? A: Yes. You can redeem the gift card online for any of those experiences. Gift Cards are for a one-time use only. If you need assistance with redeeming your gift card please call Customer Service during business hours at 704-455-9443. We are happy to help you. Q: HOW WILL I KNOW WHAT MY TOP SPEED WAS? A: Top speeds are approximate top speeds. We take the average lap speeds and add to that speed to get an approximate top speed on straight-aways. The higher programs we offer, the speeds will be closer to the actual top speed. Because it is an estimated top speed based off the average lap speed, the 5min and (1 & 2) 8min program will be skewed to the high side and the (3 & 4) 8min programs will be closer to accurate top speeds, which will be reached at the end of the straightaway. Top speed will be printed for all drivers on your graduate certificate. Top speeds will vary depending on racetrack, track conditions, weather, and individual driving ability. A: Multiple factors determine top speeds including track conditions including weather and temperature, the size if the racetrack, the banking, the experience purchased and if driving, the individual driving ability. As stated, “top speeds may reach up to” means exactly that. A. The complete terms and conditions are stated on the Booking page when making a reservation and on the gift card page when purchasing a gift card. Reservations cannot be changed for any reason less than 30 days prior to the experience. Changes made to a reservation more than 30 days in advance will be charged a $50 admin. fee. Once you are within 30 days of your reservation date, you are then locked in to that date and time. If you cancel or fail to attend, you will lose your entire reservation fee. There are no refunds for any reason. All reservations must be paid in full. In the event of inclement weather or situations out of our control, you will be notified via email, Facebook and/or phone call. There are no refunds; a gift card will be issued or you may be rescheduled. Please Note that ALL Dates Are Subject to Change. We respect and are committed to your privacy and no information is ever sold. Your payments and personal information is safe through our encrypted system. Following acceptance of your payment, a confirmation letter or gift voucher depending on purchase will be emailed within minutes of the transaction. Gift Cards are non refundable. Gift Cards are good for any of the nationwide locations and never expire. Gift Cards are good for either NASCAR Racing Experience or Mario Andretti Racing Experience. Q: Do I have to sign a waiver? A: Yes. Digital waivers will be emailed and printed waivers will be at the racetrack.